The wonderful Dave Vronay from Microsoft’s UX team has submitted this great tip to me after constantly nagging him about Desktop Aurora. With a bit of persistence, it has finally paid off. With this practical yet simple method, you can emulate the look of Desktop Aurora without any system modifications or heavy impact on performance. However, it must also be said that this approach is very flawed, as it has several downsides that makes it impractical to use for extended periods of time. But who cares, you can only get so much of eye-candy anyway. The concept is extremely simple. Run a screensaver on the desktop. But with the added power of DWM, you can get all the cool Glass effects on top of the screensaver, so it’s just like a real wallpaper. Screensavers has always supported the ability to be called to render on any surface to assist in development. But we can also utilize this method to create an interesting desktop background effect. As you can see, the results can look stunning on a Glass-abundant application such as the “Gadgets Gallery” with some modifications to the original Vista screensavers. Blog reader Nate, has coded an application which automates the entire process. His application gives you an extremely easy way of selecting the screensaver desire, and makes it even possible to start the screensaver rendering on startup. You can download Nate’s application here. You can watch a screencast showing you the steps you need to take to achieve the same result. Otherwise, if you feel confident, you can follow these steps below. Open the Spy++ tool, which is used to assist in software debugging. If you don’t have a copy, download it here. Use the “Window Search” icon, which is the binoculars icon in the toolbar. Drag the “Finder Tool” on to the desktop. The area surrounding the desktop should be bordered. Release mouse. Click “OK”. An item called “Folder View” should now be highlighted in the main window. Go up 2 parent items, and find “Program Manager”. There should be a bunch of characters on the left like “0002010C”, record this set of characters. Insert your set of characters into the “HEX value” box. Copy the resulting “Decimal” value. This is your “Handle ID”. Open command prompt. Type in “[Vista Drive]:\Windows\System32\mystify.scr /p [Your Handle ID]”, you might end up with “D:\Windows\System32\mystify.scr /p 131340”. Click Enter. To stop the desktop screensaver, simply launch Task Manager and find the screensaver process, then end the process. You can also replace “mystify.scr” with any screensaver you desire. The Ribbons (ribbons.scr) works too. Aurora (aurora.scr) can be pretty bland. The Windows Energy (SSBranded.scr) can be quite intensive, but looks pretty cool. Bubbles (bubbles.scr) won’t work well. Whilst the result is fancy for a few minutes, it becomes impractical because the desktop icons are overlapped by the screensaver rendering. But since DWM renders on top of the screensaver, you get all the fancy translucent effects with the screensaver. I suspect the ‘real’ Desktop Aurora will use a better implementation of rendering, as well have a ‘quieter’ animation than screensavers to ensure it does not distract the user from more productive work, like Solitaire. Now that’s a spicy meatball!! Good work, will have to give it a try (until the real thing turns up.. roll on 2007). This isn’t really new…. I did something similar with the winsat commands. Basically, I went to DOS, typed “winsat aurora” and then hit my “Window Key” which made the taskbar, start menu, etc come up. I could then run apps from there. @Zeromus2003: When you do “Winsat Aurora”, nothing is transparent. The theme is turned back to Windows Basic. So you don’t get any transparent windows or blurring. This is much different. You know, I just tried winsat again, and you were right, no transparency. I apologize. Now one has to ask, is it possible to use your method to work with that winsat test? Lets hope that we can see a preview of these Vista Ultimate Extras soon. I have confidence that if anyone knows/sees it, you will. No Zeromus2003, you wouldn’t be able to do this with the Winsat test as far as I know. It is only possible to do this with the screensavers because the ability to give an option to render the screensavers on any surface is already built into the screensaver functionality. To make an application like Winsat render onto a surface like the desktop will involve some hacking, unless of course, the feature is built-in and undocumented. But the Winsat Aurora isn’t the most subtle Aurora animation. It could become quite distracting on the desktop. Nice hack ! this method combined to registry hacks will be splendid oO. I think it’s worth mentioning that the screen saver will think it’s running a small preview as it would be in the display properties, so it MIGHT not display as it would when running full screen. Pretty cool hack though, I’ve developer screensavers before and never thought about playing with /p. After running for a few minutes there’s minimal system performance hit, using only 1 second of CPU time, but it does bump up CPU% usage by a noticable amount. I guess if you’ve got quad-cores you could leave it on a core not doing anything. The reason for this post is to challenge someone to try and get this to work…it may never work since DWM gets disabled during the test. I apologize again, if this seems pointless, but I like the effect and would love to see it with glass enabled. Thanks! I can map it to the root (Desktop) but it paints over the desktop items, anyway pointed the photo screen saver to the wallpapers directory and set it to pan and zoom…..
I’ve coded up an app that automates this. I’m sure it has issues, but seems to work well enough on the few computers I tried. Worked out what the problem was, I have 2 monitors and it’s not too happy about it. Odd. On a side note, I’ve noticed a small bug with Glass, if you drag a window around you’ll notice that is like a 5px-8px border area around the window where the animation is drawn a split second ahead of the actualy background. This is indeed cool; the rumors start to become reality after all lol, Let’s hope at least some of the other rumors are also true. Nice, but I miss desktop icons… Is there a way to make screensaver run just like a normal wallpaper, i.e. beneath icons? My CPU usage is also taking a small hit: it stays at roughly 10%. (This is on a Athlon64 X2 3800+ CPU.) It still looks nice though. 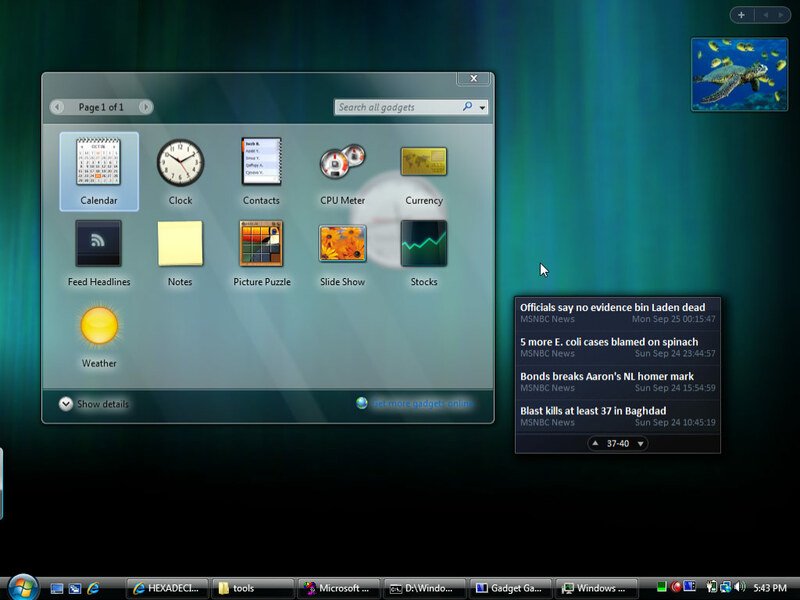 @rm20010: Try the manual method, you will be able to get it stretch to the taskbar. I think Nate’s implementation might be incorrect. That did the trick. Thanks. Is there a way to get this to start each time Windows boots without using the AnimatedDesktop tool? Seems like when I rebooted Explorer the Handle ID changed. Something funny to try for AnimatedDesktop: if you activate the desktop and have an Explorer window open it mistakenly animates the window itself. Those who are not getting the same result with my app they do with the manual method, could you try re-downloading the zip file and running the latest version? There is no official way (AFAIK) to find the window handle we are looking for. It’s not the real desktop handle, which you can get with GetDesktopWindow. It’s a window that sits on top of that. But it’s not even that straight forward; sometimes its a SysListView32, sometimes its a SHELLDLL_DefView, etc. I’ve tweaked a few things to try to handle all this. Let me know your results. If it’s still not working and you can take a screenshot of the bottom of the Spy++ read out with the nodes expanded, that should help. Happen to know which handle Spy++ reported, the or SysListView32? If you’re talking about which handle Spy++ highlighted after using the Find Window tool, it’s 0002008A “FolderView” SysListView32. it’s using the “FolderView” SysListView32 handle OR the “” SHELLDLL_DefView handle when it should be using the “Program Manager” Progman handle. I tried using the manual method on both those handles and got the same results as your program. I figured it out. If you have desktop icons showing, the proper target is SysListView32. If you have desktop icons hidden, the proper target is SHELLDLL_DefView. I have uploaded a new build that takes care of this. It also fixes the desktop icons flashing through the screen saver (same problem). I’ll just have to keep finding the ever changing handle IDs using Spy++ and using the manual method. Thanks anyways. That is a great video. Would it be all right if I put it on MSN Soapbox? Btw, supposedly this works on XP as well. @Nathan Wienberg: Feel free to put it on Soapbox. @Larry Osterman: Of course it works on XP. It’s a supported feature of screensavers since they’ve been introduced. But it’s not as exciting on XP as you don’t have Aero Glass. @pkmaximum: Not at the moment, no. I tried this on XP, and noticed since the taskbar overlays the screensaver, so should the toolbars you can add to it. So I created a new toolbar, by rightclicking on taskbar, toolbar, new toolbar and created one with the directory of my desktop. I then unlocked the taskbar and moved to a suitable position, and what do you know? It works. well, this is all nice but it does not work for dual screens -_- a message appears saying something like functionality not supported. works fine when second display is disabled though. This doesn’t get it working on both monitors, however, it does get you past the error message about the funcionality. I tried it with the bubbles.scr and it changed the display scheme to Vista basic and the bubbles began to come out slowly (and quite small) and spread across both monitors. The drawback to this was that the secondary monitor had changed its resolution to something odd. I am also having fantastic results when I turn off my second monitor. I have managed to have both monitors in use while having my primary monitor with the ‘motion desktop’. I had to disable my secondary monitor via the display settings window, execute the manual command line as above and then re-enable the secondary monitor. I was hoping to get the motion on both monitors but instead it came back up with my default wallpaper. Vista will not execute the screen savers automatically on my machine when idle time expires. They will however run on both monitors when I perform a preview or launch them independently. You can download the other MCE screensaver from there too. I have dual monitors, and it doesnt work for either when running the automated utility. better thant vista ultimate extras! Reviving what I guess is a fairly old thread…. I have the opposite problem to everyone else here – dual monitors work flawlessly both with the manual method and nate’s tool….but I want if possible only to have this going on my main screen (as I tend to keep all my icons etc on the second screen, plus, having it running there while i’m working on the main screen is distracting as hell). Any ideas? neither the automated way nor the manual method enable the screensaver/wallpaper to run at windows startup, although the automated method provides a checkbox for that option. i get an error message stating that i need a newer video card or one that has support for the latest D3D. any help? Hey, I’m really excited about this program. This is something completely new for me. I’ve been running dreamscene from Vista Ultimate, but it didn’t flow very well when it restarted the ‘movie’. Additionally, Dreamscene would take up too much of my CPU power. Anyways, the purpose of my post is to ask if this software works with 3rd party screensavers, say, something i downloaded off the internet?? Can someone tell me exactly how to do this? 2.press right button of mouse on flowBubbles.scr, select install,test,set from popup menus you like. It lets you get the handle!!!!!! ‘ Launch Screensaver as Desktop Wallpaper! ‘ problems as a result of this script. ‘ KNOWN ISSUES: It paints over your desktop icons, and I can’t fix that here. ‘ window handle. Google it. ‘cmdow.exe outputs two lines, so we split it. ‘Next, we split the second line along the spaces – the first element in array is the handle in hex format. ‘Finally, I split again to remove the 0x, so we are left with only the hex value itself. ‘Convert it back from a hex. ‘Use Task Manager to stop it running. i use Screen2Dream (freeware, http://www.dreamscene.org/download.php) to run a screensaver as wallpaper, works great on Windows XP and Vista. I got it to work but when i boot up it defaults to original background is there a way to keep it when you boot up?? I have tried a lot of things from a lot of sites……………..but i cant run any 3D rendered screensavers(eg. Deepspace by 3dplanetsoft) as desktop wallpaper in vista ultimate 32 bit. AnimatedDesktop works well, though I experience problems when the desktop is locked and then I unlock it / wake up my laptop from hibernation/etc. When any of this happens, the desktop background stays black (AnimatedDesktop prog is still running), and I then have to disable AnimatedDesktop and then re-enable it to restore the screensaver background. I suspect this having to do with logon screen/Aero re-loading after logging in to the workstation after being locked/woken up from hibernation. Does anyone have a fix/solution/suggestion for this? Thanks a lot. Good work.The Hex to Decimal converter to convert hex numbers to binary and decimal numbers.